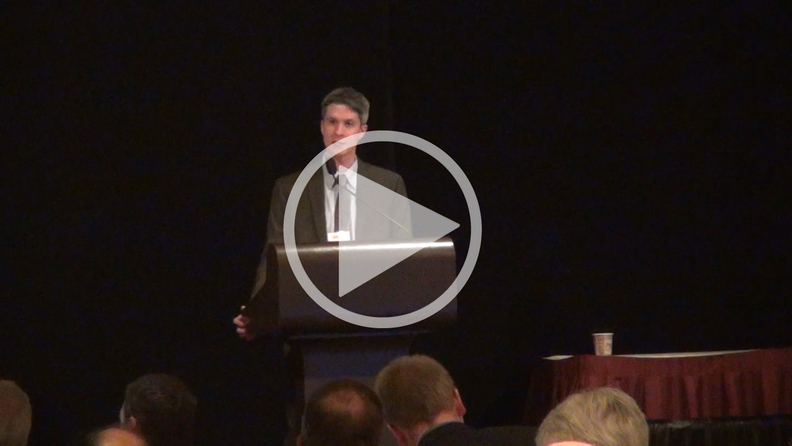 Kent Furst of the Freedonia Group delivers the keynote speech at the 2014 International Silicone Conference. FAIRLAWN, Ohio—Improved outlooks in North America and Western Europe, which suffered significant downturns during the recession, will impact the silicone market over the next three years, according to an industry analyst. Kent Furst, manager of industry research firm Freedonia Group's polymers and materials department, said that world demand for silicones is expected to grow at a rate of 6 percent per year to 2017, to just under $19 billion. Furst served as the keynote speaker at the 2014 International Silicone Conference, held May 20-21 at the Hilton Inn in Fairlawn. According to Furst, the Asia-Pacific region is expected to remain the world's largest market for silicones. It is projected to account for more than 40 percent of global demand on value, and it will be the fastest growing region. Silicone prices on average are expected to grow at a slower pace compared to the 2007-12 period, Furst said. Gross domestic product in all world regions grew at a steady pace from 2002-07 until the onset of the global financial crisis, which, Furst said, triggered recessions in most parts of the world. The notable exception was China, which continued to see double digit GDP growth even in 2009. Most economies have recovered since the recession, but Furst said it was not as significant as initially projected. The sovereign debt crisis led to a double dip recession in many Western European countries. Through 2017, Furst projects that global GDP will grow by 4 percent per year, and most world regions will return to the normal growth rate in place prior to the recession. China and India are two markets to watch as Furst labeled them as the world's fastest growing silicone econ-omies, even if growth will be tempered over the next five years. Even though China is a developing country, Furst said silicone demand was higher than the world average GDP in 2013 because of the country's manufacturing heavy economy. An increase of domestically based silicone producers has led to competition with the major multi-national companies, Furst said, which have made substantial investments in China. A substantial rate of overcapacity in the country also has prompted competition. Japan's silicone market outperformed the U.S. and Western Europe during the 2007-12 period because of the development of new applications in the electronic markets and a healthy personal care sector, Furst said. However, he said an expected decline in motor vehicle production through 2017 will limit silicone demand in Japan significantly. Overall economic growth also will be weak, with GDP in manufacturing activity rising about 1 percent per year. Helping to sustain the market will be a projected rebound in the construction market and continued favorable opportunities in the electronics market. “Silicones have a high penetration rate in Japan and historically have grown at a slow pace along with the overall economy,” Furst said. South Korea, Taiwan and India combine to account for about 60 percent of total demand among the rest of the Asia-Pacific markets, with electronics the largest market among these countries. Furst said silicone demand in these countries will benefit from a strong rise of industrial activities and consumer spending. India will continue to be the fastest growing country, with double-digit growth across nearly all silicone markets and products. An expected slowdown in vehicle production will limit demand in South Korea, too, he said. Despite the maturity of the Taiwan market, opportunities will continue to present themselves in electronic applications. The only region to see an overall decline in silicone demand from 2002-12 was Western Europe, thanks to a deep recession and a financial crisis that weakened the overall recovery, Furst said. Germany, however, had the most stable silicone market during the recession because demand from the construction sector held up well during that time, Furst said. France and Spain experienced the most significant declines. Like in Europe, silicone demand plummeted during the recession years in the U.S., with major markets such as construction and transportation experiencing negative effects. Furst said the U.S. saw pretty good growth during the mid-2000s as silicones penetrated a number of higher value applications. Consumer-oriented applications such as personal care and medical helped sustain demand during the recession, he said. He expects silicone demand to outpace GDP as construction continues to rebound and overall manufacturing activity improves. Furst cautioned that events in 2013 changed Freedonia Group's initial motor vehicle forecast downward. That, along with pricing pressure, could have a negative effect on near-term value demand for silicones. Silicone demand held up better in Canada and Mexico than the U.S. because the construction market was not as affected. Furst said demand in Canada will remain relatively slow compared to its GDP because of declines in key silicone markets such as pulp and paper and motor vehicles. Mexico should continue to experience steady overall growth in silicone demand, mainly because of increased construction spending and an improved U.S. economy for exporting goods, he said. More than half of global silicone exports originated from Western Europe, the executive said, with another 30 percent coming from the U.S. and Japan. Outside of those countries, most of the rest of the world are net importers of silicone. China is by far the largest importing country. “Although developing countries like China and India have become more significant as silicone consumers, silicone production remains primarily in the developed world,” Furst said.